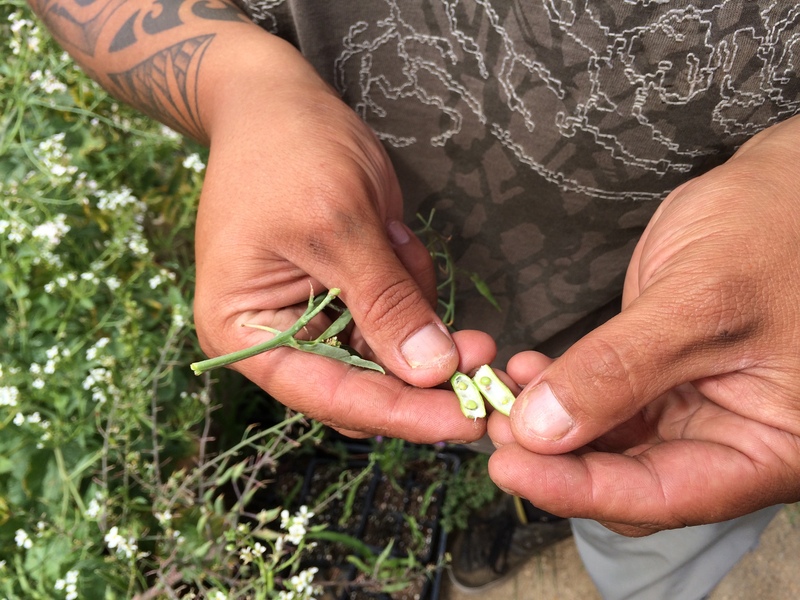 After leaving Arizona in mid-July, we headed northwest, into the dry mountains of western California, to visit the Big Pine Paiute Tribe Sustainable Food System Development Project. 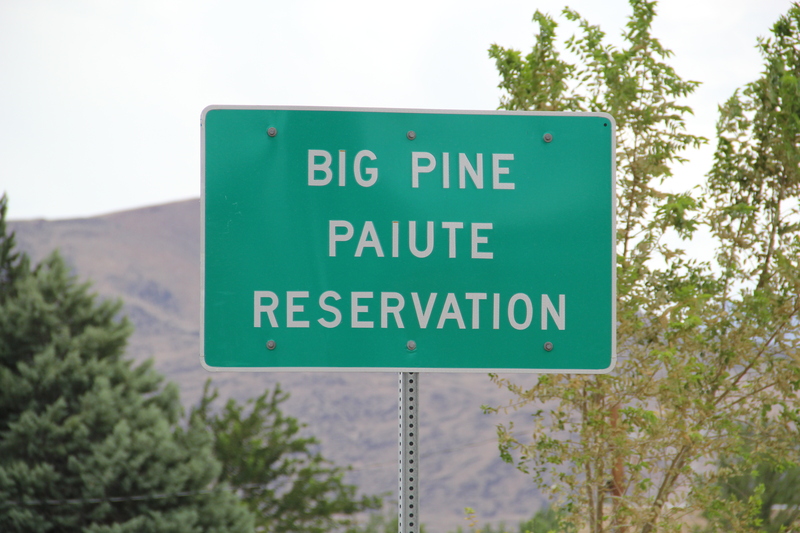 The Big Pine Band of Owens Valley Paiute-Shoshone Indians are located in the Valley with the Bishop Paiute-Shoshone, the Fort Independence Indian Community of Paiute Indians and the Lone Pine Paiute-Shoshone Indians. The 75 mile long Owens Valley (once called Payahüünadü, or “place where the water flows”) is about 200 miles north of Los Angeles (which historically received 1/3 of its water from the Valley) and is bounded by the Inyou Mountains on the east, the Coso Range on the southeast, Rose Valley on the south, the Sierra Nevada Mountains on the west, and on the north by Chalfant Valley. Mountains on either side reach about 14,000 feet in elevation, and the valley floor is at 4,000 feet, making it one of the deepest valleys in the country. 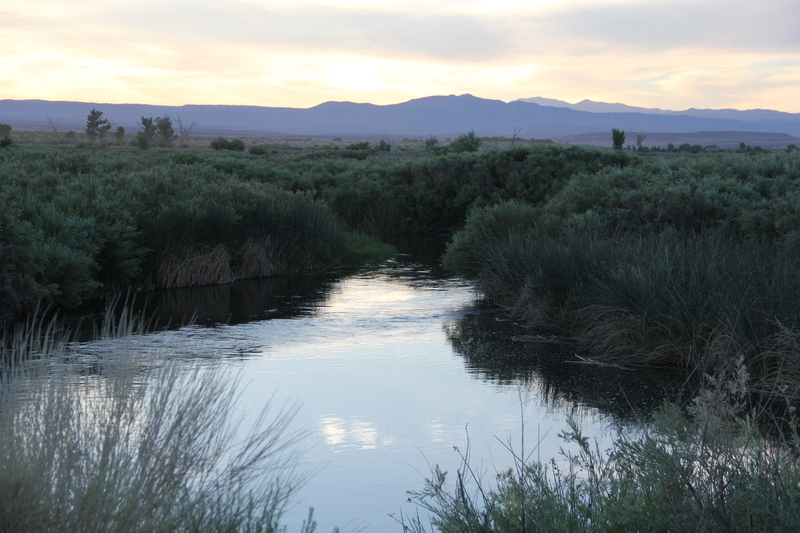 For thousands of years, run off from melting snow in the Sierra Nevadas would come into the valley through numerous creeks, and into extensive irrigation systems created by the Paiute. 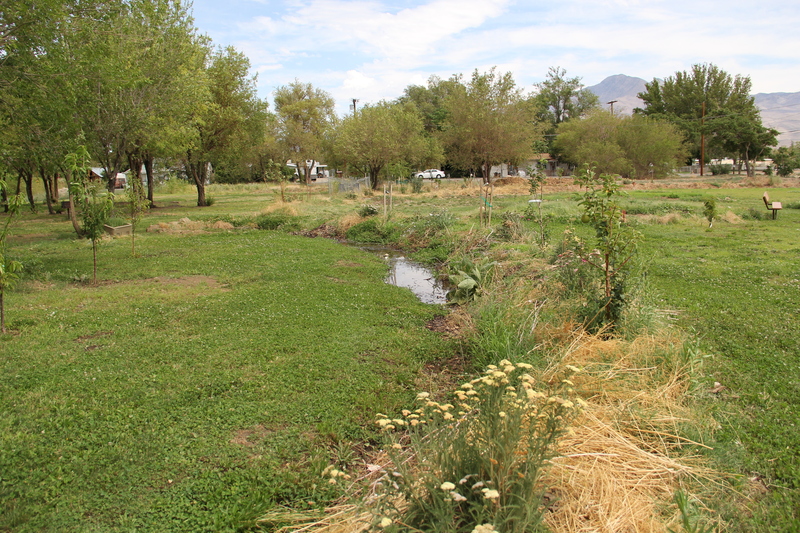 These ditches moved water around the valley to create habitat hospitable for the roots, grasses and animals that the Paiute subsisted on. This system of managed wild-crafting bewildered early anthropologist Julian Steward, who couldn’t fathom why the Paiute had irrigation but no formal agriculture. The Paiute moved seasonally, heading into the White Mountains in the late summer and fall to collect pine nuts. 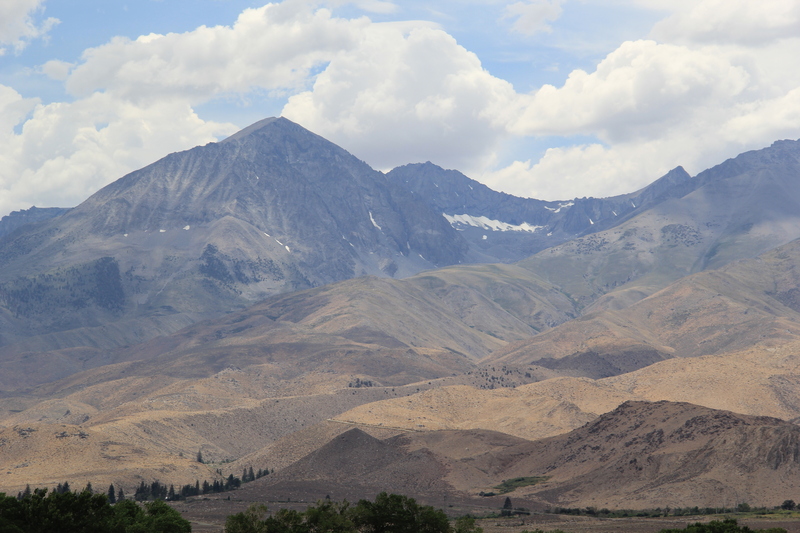 In the 1860’s, settlers came to the Owens Valley and began to settle on and fence off Paiute homelands. This restricted the movement of both indigenous peoples and the animals they had hunted. Livestock also grazed down traditional plant food sources, also made inaccessible by the fences. Fighting broke out when Paiute people turned to settler cattle as a food source, and ranchers retaliated, leading to years of fighting. The US Calvary rounded the indigenous residents up and forced them on a 200-mile march in the July heat through the mountains to Ft Tejon, south of present day Bakersfield. Paiute people did not know how to survive in this new environment, and gradually made their way back to the Owens Valley, which had been transformed by white settlement. Many went to work on settler farms and ranches as one of their only means of survival. In the mean time, the burgeoning city of Los Angeles was looking for a new source of water to assist with their expansion, and saw the Owens River as a viable option. Representatives from the city rushed to buy up land and water rights, even secretly thwarting a federal Reclamation Service project on the river in order to secure the water for Los Angeles. The 233 mile-long gravity fed Los Angeles aqueduct was built in 1913, filled with water drained from the Owens Valley . When surface water wasn’t enough due to a drought, in the 1920’s and 30’s Los Angeles drilled 171 wells. With the installation of the second barrel to the LA Aqueduct in 1970, Los Angeles began to drain groundwater for the growing city, . Farmers who had tried to remain in business even as their neighbor’s properties were bought up by the city were unable to survive as groundwater levels dropped. By 1933, Los Angeles had acquired 85% of all residential and commercial properties in valley towns and 95% of all farm and ranches along the valley floor. Citizen outrage eventually lead to the divestment of some town properties by the City of Los Angeles, but all associated water rights were retained. Today, the city remains the largest private owner in Owens Valley with its 314,000 acres predominantly located within the valley’s floor. (for more information about the history of the Los Angeles aqueduct, check out the “There it is- Take It!” documentary project). The reservations for the Bishop, Big Pine and Lone Pine Paiute were initiated by an Act of Congress in 1937 that swapped 3,126 acres of federally reserved Indian lands for 1,511 acres of land owned by the City of Los Angeles, in an effort to consolidated Indian land holdings but mostly to ensure Los Angeles access to water. Although Los Angeles agreed to supply a set amount of water to the reservations, the land exchange did not formally include water rights. The Los Angeles City Charter does not permit sale of its water rights without the approval of 2/3 of city voters, so in 1939 when the deed was signed, it was negotiated that the matter around water rights would be settled at a later date. To this day, the issue of water rights has not been resolved. Negotiations have been taking place since the 1990’s but disagreements between the tribes in the Owens Valley Indian Water Commission (who were part of the 1930’s land swap) and the Benton and Fort Independence Tribes (who currently possess water rights on their reservations) who also want to be included, have stymied negotiations with the city of Los Angeles. What was once an area full of agriculture is now dry, with a few abandoned silos. Owens Lake, which went dry in 1926 after the Owens River was diverted to the aqueduct, became the largest emitter of PM10 (particles smaller than 10 microns in size) in the nation. The Great Basin Unified Air Pollution Control District (GBUAPCD) Dust cam which will give you live images of the very dry Owens Lake. The GBUAPCD, formed to record and mitigate air pollution in the region, recorded PM-10 levels 100 times over the allowable federal standard, coming from the dry lake bed. This dust is a caustic mix of arsenic, cadmium, nickel, salts and other contaminants, which have caused health problems for the 40,000 residents of the Valley, and according to a community health study conducted in 2012 is responsible for increased rates of lung cancer. In addition, there was a push for remediation from China Lake Naval Weapons Center, located ninety miles to the south, because dust storms were interfering with flight tests, resulting in millions of dollars of losses. 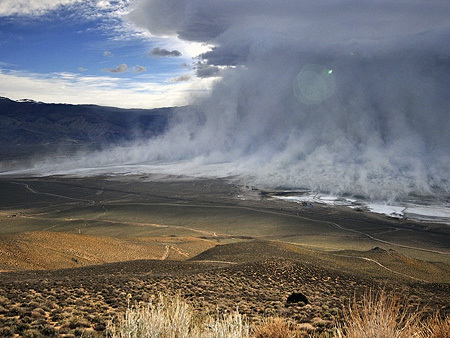 A Memorandum of Agreement with the City of Los Angeles in 1998 initiated the largest dust control project ever undertaken in North America, and has resulted in some water being left in Owens Lake. The City is now in the process of suing GBUAPCD to keep some of that water. The residents of the Owens Valley are also currently fighting with Los Angeles to prevent the construction of a 1200 acre solar panel ranch to export solar energy to the City. 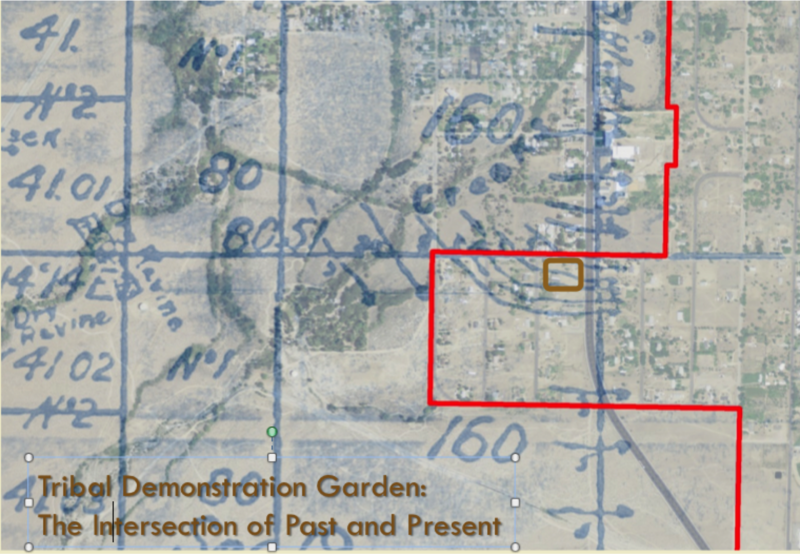 This 200 megawat facility that would entail scraping all of the vegetation, and spraying herbicides on a site of cultural significance for Paiute, and adjacent to the Manzanar War Relocation Camp where Japanese American residents were imprisoned during WWII. 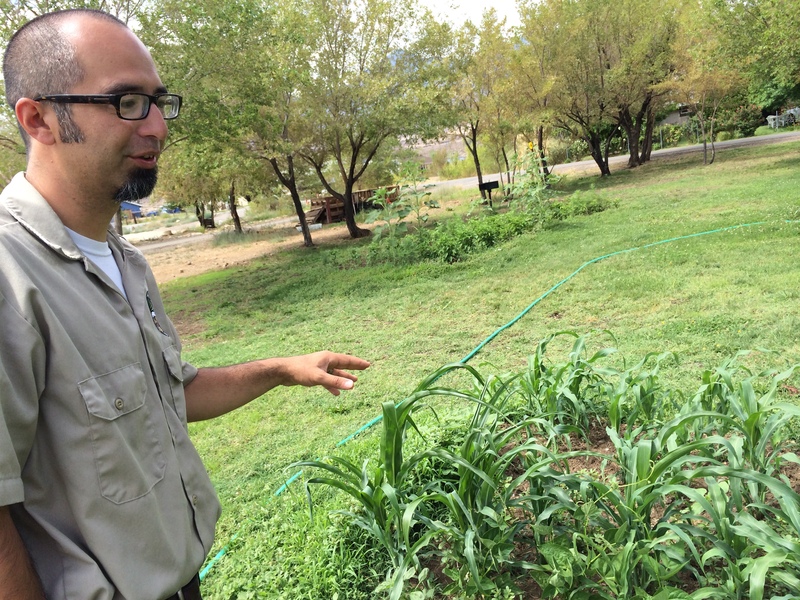 It is in this context, in a Valley that has been fighting the goliath of Los Angeles for a century, in a Paiute community that has not been allowed to fully practice their traditional food culture for 150 years, that Alan Bacock and his associates decided to start a permaculture demonstration garden. The goal was to demonstrate how to utilize creek water for irrigation, and to inspire people in this food desert to both improve their land and provide healthy food for their families. 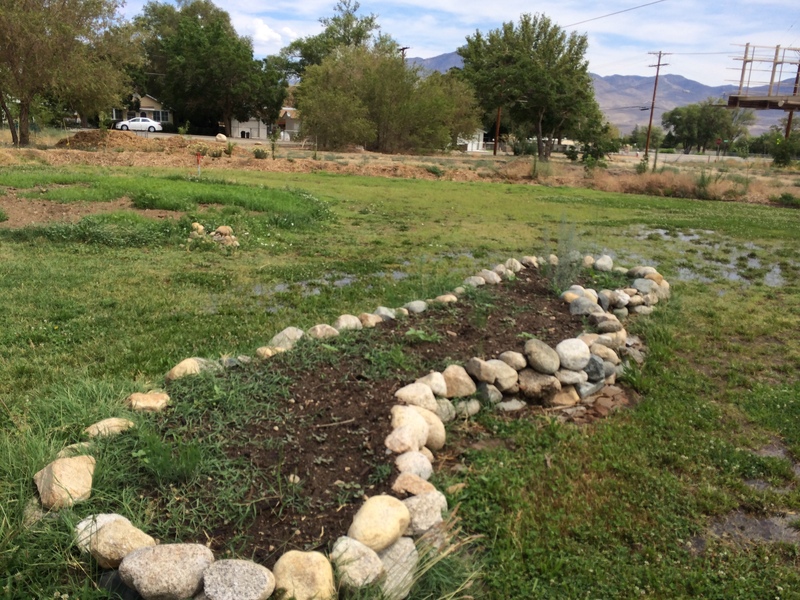 With funding assistance from the First Nations Development Institute, Toiyabe Indian Health Project, Indigenous Farming Project,and Metabolic Studio (among others), the Big Pine Paiute Tribe Sustainable Food System Development Project has set up a demonstration garden, showcasing swales, mulching, and companion planting. 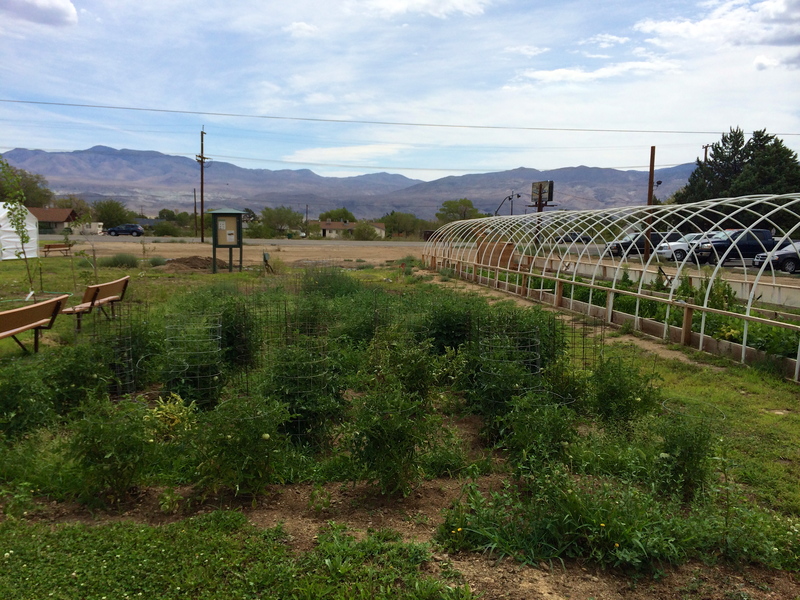 In addition, the program works to help local families plant their own gardens. This past year Alan and his colleagues helped 30 families plan reasonable size gardens, till their soil, and by providing seeds. They also provided community workshops on planting trees, squash and tomatoes, on preserving food from the garden, on how to build a bioswale and a raised rock bed using natural materials on their land. Alan wanted residents to see that they didn’t need to be rich to enjoy good organic food—their land could provide for them as it had for their ancestors. And by utilizing composting rather than fertilizers and pesticides, participants would be helping to protect their water source. Alan also wanted to provide an economic opportunity for these new gardeners, and set out to establish a farmers market. A professor from Cal State Chico did a feasibility study, which was then presented to the tribal council, who approved. 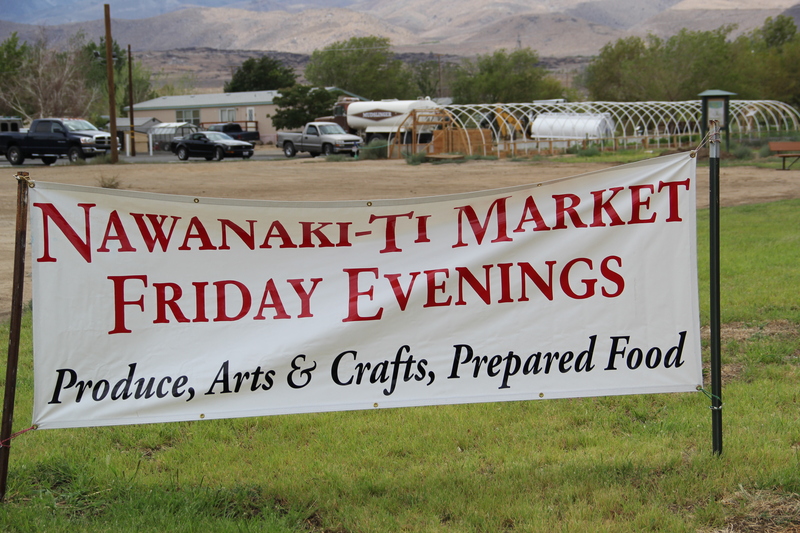 The weekly Nawanaki-ti market (“the place to gather items”) is currently in its second year. Alan notes that the market has not only been good for the tribal community, but for relationships with the adjacent non-native community with whom there has been tensions for generations. Alan feels the market provides the space where people don’t have to take up or resolve those issues, but can develop relationships to establish trust for resolving issues in the future. In the future, the Sustainable Food System Development Project hopes to work more closely with schools, and continue to develop more gardeners in the community. 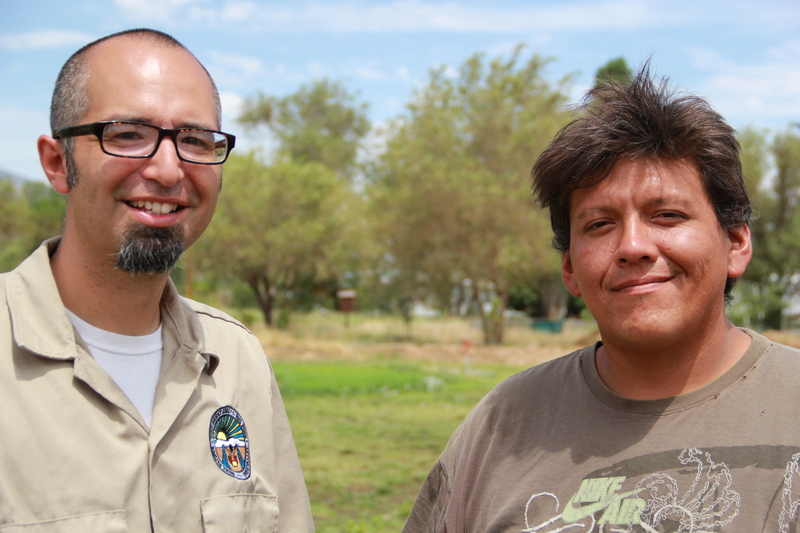 As the tribe continues to fight for their water rights, Alan wants to ensure that residents know how to best utilize the available water, to create food and habitat for wildlife like the rabbits and deer the Paiute once hunted.